If your dog suffers or did suffer from a heart disease we would be thankful if you contact us, so that we can publish your dog’s name in our list of affected dogs. You are also welcome to fill in the following declaration of consent and send it to us by e-mail. If you have any (specific or overall) questions about heart diseases you’re welcome to contact us as well. We try to answer your questions with best knowledge and conscience and from our own experiences. If you are a breeder or even perhaps an animal cardiologist and want to offer support to us in any way, we would be very grateful for any assistance or perhaps professional annotations. Now you are probably curious who we are. We would like to introduce ourselves. On March 17, 2016 Nevio sadly lost his long fight. His huge heart had stopped beating. He will be in my heart forever, for he was and remains my unforgotten little boy. Since fall 2016 I share my life with little Luis, a chocolate Labrador Retriever as well. He is in full health - we hope it remains like this. The precautionary heart ultrasound, that was obvious for me, fortunately was clear. Hello… I am Sophie and I live together with my husband, our daughter and our Labrador Retriever Artus in Berlin. Until the 25th of April 2017 Artus' half-brother, our little Punch's heart Schröder, belongs to our little family. Schröder's story can be found on his page under "progress reports". Because of their close relationship we also took Artus to a preventive cardiological examination on Jul 12th 2013. Fortunately his heart is very healthy. I always was very grateful for the problems we had with Schröder’s puppy tooth which drew our attention on his heart disease. Thus we knew what was going on and could set our days around his disease and were able to help him to live the best life he could. Also Artus and our daughter were taking their share in it: their mere presence supported Schröder’s health and affected the fight against the heart disease in a positive way. We and our cardiologist Dr. Kattinger both always agreed on that. Sadly, on 25th of April 2017, Schröder's fighting spirit was exhausted and so he piecefully fell asleep after a walk with his family and didn't woke up again. We will never forget him and he will be living in our hearts forever! 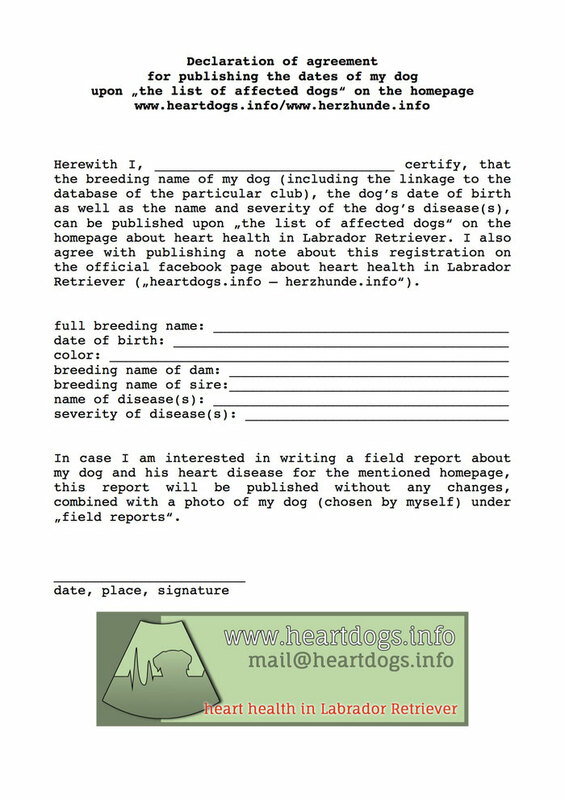 You would like to link us on your webpage to spread the word about possible heart diseases in Labrador Retriever? We would love that! Please use our banner below and sent us a short email so we know who linked us.